Arrived at the Weisel Hostel at around 5 pm. It had been a long day and I was relieved to make it to the hostel so early. I'd have plenty of time rest and hang out on the hostel grounds. But when I got to the front door, I found a sign on it, "Closed until Sept 1"! Oh no! I peeked in the windows hoping someone would be around so I could ask them if it was ok to pitch my tent on the side lawn. No one was around. I hated to do it, but I had to move on. 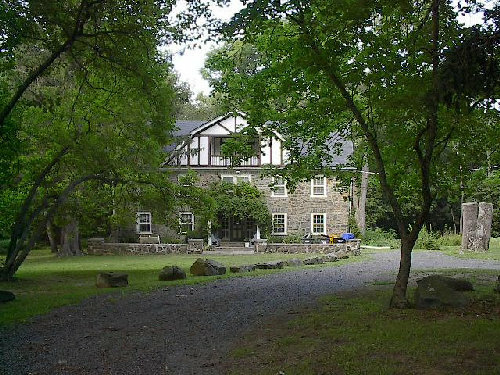 Checked the hostel book to find the next closest hostel--Evansburg State Park Hostel in Collegeville, PA. Thought I'd find it before dark--Wrong! Closed...Oh, and it looked so comfortable!